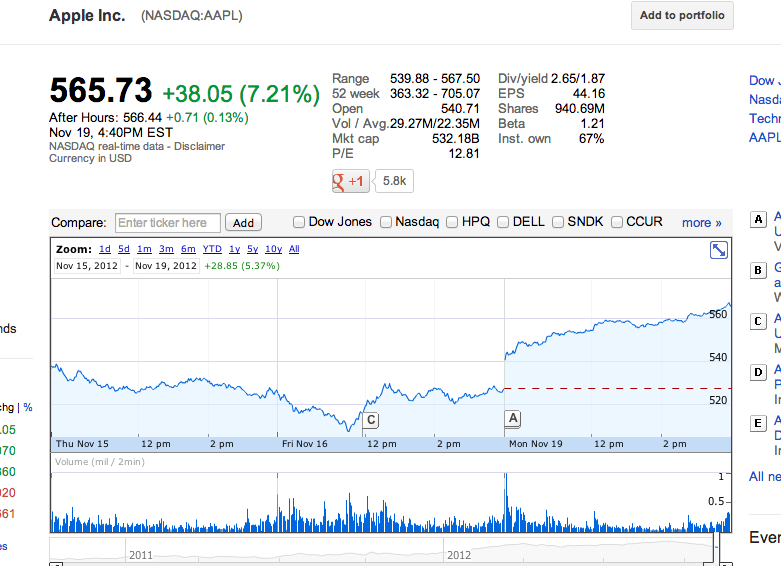 Apple’s share price rose considerably today, climbing 7.21 percent during today’s trading to a closing total of 565.73. The climb comes after the company’s stock hit a six-month low last week, hitting the bottom of a 25 percent drop-off since September when it released the iPhone 5. Analysts today expressed the opinion that the gains made today reflected a return to sanity for the stock. The nearly 40 point gain today returns Apple’s share price roughly to where it was at the beginning of November, which is still a far cry from its September high north of 700. Market cap sits at around $532 billion, down from September’s high of nearly $660 billion, but the gains made today are significant, with a strong bounce back that has countered sizeable but still markedly smaller losses like the 2.10 percent value it shed during trading on Thursday. As pointed out in our earlier article, Apple is still essentially the same company on paper that it was in September, at least with regards to growth and its own financial performance. You could say the company faced a sort of “perfect storm” situation with regards to highly visible problems in recent months, including the executive overhaul that saw the departure of iOS head Scott Forstall and recently hired retail chief John Browett, and it also faced the iOS 6 Maps backlash from users and press. Also contributing to the decline according to analysts on Friday were upcoming tax hikes. The healthy performance of the stock today indicates that the market saw this six month low as a good time to buy (what with recent product releases and positive earnings reported for the most recent quarter), especially since the six-month low got as much press as it did. Many analysts still have Apple target share prices well north of $700, despite last week’s less-than-impressive performance. It’ll likely continue to have a solid “buy” rating with most firms, especially since it continues to have trouble meeting demand for its latest products heading into the holiday shopping season, but the share price may continue to fluctuate a bit until we see firm numbers on holiday sales, most likely during Apple’s quarterly results.